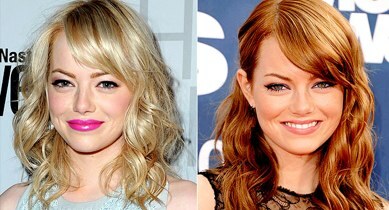 America's new sweetheart and "it" girl Emma Stone returned recently to her signature sizzling copper-red haircolor! If you love her look and have a classic highlighted blonde client ready to take the leap to fabulosity try these formulae and technique tips. Creating the glinty copper background foundation on Emma's natural level 6 is really quite easy. Filling the blonde with a red or copper filler is obviously key and will set the hair up for daily success where durability is concerned. Also, it is never a bad idea to introduce a richer red tone as a lowlight to anchor the shade and to naturalize the overall canvas. Lastly, decide if you think some retouch pieces of blonde need to be created from the regrowth into the existing blonde. Otherwise, after all this tinting back, the hair closer to the scalp may showcase the obvious outgrowth prior. When in doubt, "connect the dots" a little to naturalize and then begin the real procedure and technique. Mix 60mls water + 10mls Topchic 7OR + 10mls Topchic 7K. Use a Colorance bottle to mix and shake this formula until well blended. This mixture will be quite loose and easy to apply to all of the obvious blonde pieces using the brush tip applicator. Now go in and apply your background foundation. Use 40mls of 20 volume Topchic developer lotion + 20mls Topchic 8KG + 20mls Topchic 7KR. This 20 volume mixture, in conjunction with the client's body heat, should be plenty to achieve the appropriate amount of lift without becoming too "hot". If you assess coarseness or extreme tenacity use 30 volume instead. Once application is complete, mix another batch of this same formula but use 10 volume. This will be applied right over the previously "filled" hair and should give you the proper "on tone" deposit. Mix an additional shade to use as the lowlight using 20mls of Topchic 6KG + 20mls 10 volume Topchic developer lotion. Use foils or color boards and work the two formula thru the head alternating the 6KG in about every third slice. Consider using the 6KG formula on all the underneath hair to create depth and shadow unless the previous colorist had left it dark for the blonde. In that case, that solid hair underneath may appreciate having the original "on scalp" formula pulled through instead. Process for 30 Minutes. You should have a beautiful result at the scalp and the cancelled out blonde pieces should be on tone, dimensional, and believable. All haircolor techniques- especially tintbacks- appreciate and look much lovelier with some type of acidic overlay. An application of Goldwell Colorance 9KG + 7KR together will increase the shine and color quality overall. Consider an overlay, or just slice huge chunky panels through, of Goldwell ELUMEN. Try a mix of 55mls KB@7 + 4mls GK@all + 1ml RR@all. If you enjoy the art of haircolor and love formulation and conversions come play with us soon at one of our four North American Academies!